Both doors shown above will lead you into the office. The door on the right will bring you right to the line for information where you’ll receive your transaction ticket. Unless you’re there for a knowledge or road test, be sure to wait in this line first! As mentioned in earlier posts, transaction tickets are very important at the Department of Motor Vehicles so hold onto it tight. Teens or adults visiting for a scheduled road test will check in to the left of this entrance. 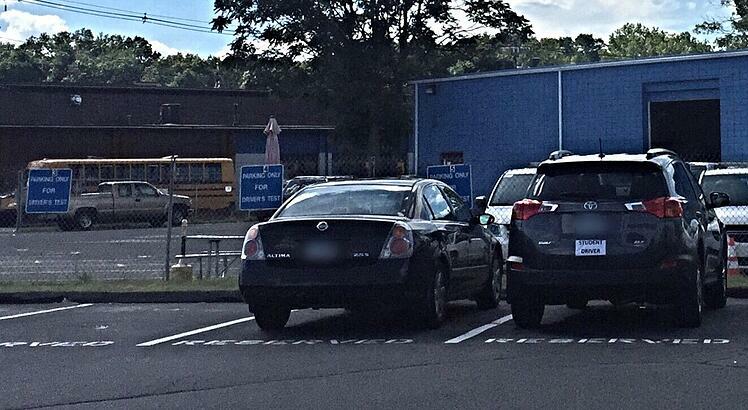 If you’re there for your learner's permit, your best bet is to enter through the door shown on the left. You’ll see the testing window as soon as you walk in. Don’t forget to have all ID’s, needed forms, & your DMV appointment confirmation within easy reach when you go to check in; they’ll need to be shown before you’re even able to wait to take the test. Bring something to keep yourself occupied: a sketchbook, a good novel, or at least a power bank for your cellphone. I was there for about an hour and saw many of the same faces still waiting to receive their permits when I stepped out. There were a couple of things I noticed about this office that seemed to make all the difference. There were, at the very least, a couple dozen more chairs in the room compared to the last two I had visited. Not having to squeeze your way through a crowd of irritated faces because they’re all happily sitting down instead makes coming here a lot less uncomfortable. They also had a snack bar right next to the line you wait in for a transaction ticket. Although the Wethersfield location did have a café, it wasn’t accessible unless you left the public room and went downstairs, which is a cause for concern: if you aren’t there when your name or transaction number is called, employees have to assume that you decided to leave. So having food easily accessible, all while still being within earshot of the employees & TV’s, is a beautiful thing in the world of DMV’s. She told me that when the instructors go out to inspect the vehicles before the road test begins, they want the cars pulled in nose first, as shown above. This is so they can see how well you can back up your vehicle more than once, as you’re required to back into a space at the end of the test… Instructors will ask, “Are you straight?” & your answer will make or break you! Be positive before you answer; don’t hesitate to pull forward, align yourself a little more, and then say, “Yes, I’m straight.” if you’re unsure. She also told me that most people who came back from the test with unhappy expressions failed because they didn’t yield to pedestrians at crosswalks within the DMV lot & they didn’t stop when a light turned yellow. Keep all of this in mind when taking the driver's license test. Sending many "thank you’s" to this kind woman for sharing her knowledge for me to relay back to you all! All in all, this was the best visit I’ve had so far. Be grateful if this is your local office because you’re in good hands; especially after reading this! 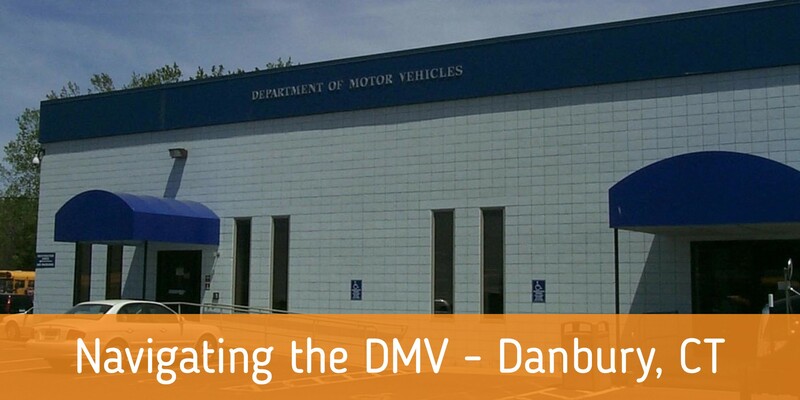 Your friends at The Next Street are hoping it helps you navigate the Danbury DMV with ease. Our next stop: 1985 State Street, Hamden, CT.
Ready to get your permit but not sure where to start? Download our FREE Permit Prep eBook for everything you'll need to know!